Saturday Selection - Taylor, Cleeves, Kelly and co.
I’ve mentioned Andrew Taylor’s marvellous Bleeding Heart Square more than once in this blog, and on Thursday the Penguin paperback edition appeared. The story is set in the 1930s, and is a really good read. The paperback includes an afterword by Andrew which I found very interesting – to my mind, the trend for including supplementary material in books is certainly a Good Thing. I’ve just received from Macmillan a proof copy of Ann Cleeves’ Red Bones, the third entry in her Shetland series – it’s been described as the Shetland Quartet, but who knows? Maybe the success of the books will prompt Ann to keep the series going, along with her novels featuring Vera Stanhope. To be published this week, again by Penguin (and I think as a paperback original) is the latest novel by Jim Kelly. It’s called Death Wore White, and represents a departure from his previous books; I haven’t read him previously, but a number of friends whose judgement I respect enjoy his work. This is an ‘impossible crime’ story – according to the publicity, the killer ‘struck without being seen, and without leaving a single footprint in the snow’. I look forward very much to sampling this one. A couple of weeks ago, Bantam brought out Breaking Point by John Macken. This one features a forensic scientist who was once fired by the CID. Here he is involved in a case where the GeneCrime police unit ‘is frantically trying to stop a seemingly invisible killer who strikes in the middle of the day on busy Tube lines.’ I was on a panel with John Macken (the name’s a pseudonym) at Crimefest in Bristol last year, and his books are developing a following. Soon to appear in paperback is the intriguingly titled The Risk of Infidelity Index by Christopher Moore, published by Atlantic. Moore is a Canadian who has published nine novels, but this is the first to appear in the UK. It’s set in Bangkok and features a private eye called Vincent Calvino. The end of February sees the appearance of The Fifth Floor by Michael Harvey (Quercus). Harvey (no relation to John) is an American television writer, and his novel features ‘a tough-talking Irish cop turned private investigator’, Michael Kelly. Kelly investigates ‘a web of corruption and intrigue’ in Chicago. A very good critic, Marcel Berlins, has applauded Harvey’s writing, so I shall be interested to have a look at it. Finally, a book from the writer and director of the film ‘I’ve Loved You So Long’ – Brodeck’s Report by Philippe Claudel. It’s translated from the French by John Cullen, who has himself been short-listed for several awards, and is published by Maclehose Press (a division of Quercus.) It’s described as ‘an immensely powerful chronicle of a community’s fear and loathing of what is strange, unknown, and from the Outside’. Gory Knight, my latest contribution to Patti Abbott’s series of forgotten books, was published in 1937, not long after the appearance of Dorothy L. Sayers’ renowned Gaudy Night. It’s a parody, written by the partnership of Margaret Rivers Larminie and Jane Langslow. It’s a fun book. The plot is slight, and perhaps stretched out too much, but there is much pleasure to be had in the rendering of the eccentricities of Poirot, Wimsey and Bunter in particular. I was glad to stumble across it – initially in the pages of Jamie Sturgeon’s catalogue. Jamie sold the book before I called him, but he referred me to another crime fan, the locked room expert Bob Adey, who was able to supply me with a copy. There is an intriguing family connection between Larminie and a leading contemporary writer, Margaret Yorke. I hope to write an article about this aspect of the story at a future date. But I know nothing about Langslow. If anyone can tell me anything about her, or about how the book came to be written, I’d be very interested to hear it. Wanted Man is sub-titled ‘The Forgotten Story of Oliver Curtis Perry, an American Outlaw’. It was written by Tamsin Spargo four years ago, but I only came across it recently. It turns out that Tamsin is an academic based at Liverpool John Moores University, where she is Director of the School of Media, Critical and Creative Arts, and a Reader in Cultural History. She and I have a friend in common and he prompted her to get in touch and send me a copy of her book. I’m glad he did. I didn’t know what to expect, never having heard of Oliver Curtis Perry. His story, I discovered, is quite fascinating. Tamsin Spargo describes his brief career as a train robber, but this is in some respects merely a prelude to the meat of the story, an account of a proud and contradictory man who persists in cocking a snook at authority. After he is caught, he behaves like a celebrity, arrogant but entertaining. However, authority has its revenge. His prison sentence is harsh, and because he continues to defy those with power over him, his conditions worsen. All this is quite poignantly described. There is one especially shocking episode during Perry’s incarceration that startled me not only because it came as a bolt from the blue but also because it bore an uncanny resemblance to an element of a story idea that I’ve been toying with idly. A weird coincidence. I enjoyed this book. It is highly readable – not something that can be said of everything written by those in the academic world – and tells a fascinating, if sad tale. Tamsin Spargo is quite an easy name to remember, and the quality of this book suggests to me that you will hear much more of her in the future. One of the very best British detective shows on tv (at least, in my opinion) was Shoestring, which ran for about a year, and 21 episodes, starting in 1979. The show introduced me to Trevor Eve, one of the most watchable actors, making a name for himself as Eddie Shoestring, who takes up a career as a gumshoe working for a Bristol-based commercial radio station after suffering a nervous breakdown. I’ve just watched The Dangerous Game, which proved to be the very last Shoestring case. It’s set at Christmas, and it’s worn surprisingly well, with the characteristic blend of a neat story idea and Eve’s idiosyncratic and memorably intense work as the oddball hero. In this one, he discovers that a number of dangerous electrical games have been sold as Christmas presents. In the run-up to Christmas Day, he has to track all the games down in a race against the clock before a child is seriously injured or killed. As with many episodes, the cast was impressive – it included those splendid performers Celia Imrie and Burt Kwouk. Doran Goodwin made her usual all too brief appearance as Eddie’s not-quite love interest; she is an appealing actor and it’s a pity she’s been, at least as far as I know, long absent from major roles on the screen. I’m not sure if viewers outside the UK ever saw Shoestring, but it acquired a devoted following here. Eve gave up the part because he didn’t want to be typecast, and the writers used a similar premise in a more glamorous setting to create Jersey’s finest cop, Bergerac. John Nettles did a great job as Jim Bergerac, but I still prefer Shoestring.
' I decided to write a biography of Sir Bernard Spilsbury after learning about the extraordinary ‘disappearing bruise’, which convicted Sydney Fox of matricide in 1930. Spilsbury’s superb performance at trial, dismissing a strong defence case by the use of restrained and deadly testimony, gave lethal substance to the legend of the ‘incomparable witness’. Research impelled me to the view that the ‘Honorary Pathologist to the Home Office’ had feet of clay. The more I delved, often assisted by official records opened up at my request, the worse things became. I’m now convinced that several defendants were convicted of murder and hanged on flawed evidence. Although Spilsbury was - as lawyers sometimes say – a ‘naughty’ witness, I’ve a sneaking admiration for his style. Handsome, tall, elegant, immaculately-dressed – a Fred Astaire of the courtroom – his practised act for years held policemen, press reporters, jurors, judges, and Home Secretaries helpless and spellbound. Then came the Fall – and a supremely nihilistic suicide, almost blowing up University College Hospital in the process. Spilsbury, of course, made his name in the Crippen trial, with his firm declaration that scar tissue – consistent with an abdominal operation undergone by Mrs Crippen – had been found in the body parts. In Lethal Witness, I describe how Spilsbury’s findings on this highly contentious issue have been discredited by modern expert evidence. Martin’s latest novel, Dancing for the Hangman, is a sharp new take on the Crippen affair and a welcome contribution to the debate, not least because we’re approaching the centenary of Belle Elmore’s disappearance at the end of January 1910. What do we make of new DNA evidence, resulting from the examination of a microscopic section taken by Spilsbury from “the remains” (wonderful expression!) found at Hilldrop Crescent? The University of Michigan’s Dr Foran has claimed that this was not a slice of tissue from Mrs C, but rather from the body of an unknown man. Presumably Foran and his team were aware of the possibility that the sample might unwittingly have been contaminated when Spilsbury prepared his slides in September 1910, but I’ve yet to see an academic paper setting out a detailed account of Foran’s methodology and conclusions. On the other hand (along with Dorothy L Sayers) perhaps we should always prefer the probable impossible to the improbable possible. Anybody seen Belle lately? 2010 looks like being a vintage year for Crippenistas. I’ve invested in the complete collection of DVDs from the 1996-67 BBC TV series ‘Adam Adamant Lives!’ It’s a series I’ve mentioned before. Like ‘The Avengers’, ‘Doctor Who’ and ‘The Prisoner’, it’s utterly redolent of Sixties culture – right down to the melodramatic Kathy Kirby theme song - and it still bears watching today. For those who don’t know it, the premise anticipates the Austin Powers movies. Adam is a swashbuckling Victorian adventurer, cryogenically frozen by his enemy, the mysterious and devilish ‘The Face’, and restored to life in Swinging London. He rapidly acquires a gorgeous companion, and even a butler, who assist – and sometimes obstruct – him in his battles on behalf of Good against Evil. The series featured many good actors, and one legendary director – the great Ridley Scott, long before Blade Runner. There’s a marvellous account of the various names that were considered for the character after it was decided he had to be original, and not Blake. No question about my favourite – Darius Crud. Can you believe it? I swear it is true – I have the DVD to prove it! To my mind, it’s a great sadness that ‘Darius Crud Lives!’ was never brought to our screens. It would have acquired classic status. When I first watched the show, at the tender age of eleven, I thought that Juliet Harmer was probably the prettiest tv star I’d ever seen, and all these years later, I’m not entirely sure I want to revise that judgement. Yet soon she more or less abandoned acting. Her role as Adam’s enthusiastic companion is still her great claim to fame. But a claim to be proud of, I think. The show was flawed, perhaps because the scripts were rushed out and therefore uneven, but it possessed elements of brilliance. One of the innumerable gaps in my tv viewing over the years was the BBC series ‘Murder in Mind’. I never paid a lot of attention to it when it was shown a few years back, and I didn’t have any reason to believe I’d missed much. At least, not until, on the excellent Alibi channel, I stumbled over a repeat of an episode called ‘Sleeper’. I thought I’d figured out the surprise ending at an early point, but happily the apparently crucial clue turned out to be a red herring, and the writer had a couple of pretty good tricks up his sleeve. This was satisfying if undemanding television, and I will certainly be glad to watch more episodes of ‘Murder in Mind’ in the future. Yet I didn’t want this post simply to be a list. I’m sure that readers will find plenty of interest in all the blogs listed in the blogroll - please don't overlook the ones I haven't mentioned specifically in this post. I thought that, as well as mentioning some blogs by name, I’d also make one or two brief general observations. There are different types of inspiration, as well as different sources. For instance, Kerrie’s blog contains a number of adventurous technical features that one day I’d like to emulate (lack of time, as well as a massive techy expertise, is the snag here.) Then there are blogs which contain a good deal of useful info – examples include Karen Meek’s Eurocrime blog, It’s a Crime, Detectives Beyond Borders, Petrona (Maxine Clarke is an advocate of Friendfeed, something else I regret not having got round to investigating in sufficient detail yet), Murderati, Criminal Brief (Steve Steinbock’s Friday column is a definite must-read), Gerald So’s blog, and The Rap Sheet. Several American writers have terrific blogs – Ed Gorman and the witty Bill Crider are among the names that spring instantly to mind. Patti Abbott’s series of Friday’s Forgotten Books is fascinating, and I am really pleased to be involved with it. Then there are the blogs of readers and fans, sometimes focusing heavily on crime, like Ali Karim’ The Existentialist Man (with an emphasis on the contemporary), and Xavier Lechard’s At the Villa Rose (with an emphasis on the traditional detective sotry), sometimes ranging:far and wide (beyond books, let alone mysteries) for example, Letters from a Hill Farm, Books Please, Confessions of a Book and Opera Lover, Harriet Devine's blog, and the blogs of Roberta Rood and Lourdes Fernandes, two Americans I met when they were visiting England, and before I started blogging. In fact, I’ve met a number of fellow bloggers for the first time in the past twelve months, although often all too briefly, and this too has been a tremendous plus. And then there are blogs which, at least at first sight, don’t have much to do with my fields of interest. One is Juliet Doyle’s Musings from a Muddy Island; yet her interest in letterpress has influenced me in developing one of the characters in my current work in progress. Another is a blog which links to Jane Gallagher’s writing blog – also by Jane, it’s called Work that Wardrobe. Now, nobody who has ever met me would ever confuse me with a dedicated follower of fashion. Yet as a novelist, I’m bound to be interested in most things – including what my female characters wear. But it’s a subject on which I’m pretty ignorant. And it occurred to me not long ago that I could pick up some good ideas for their appearance from Jane’s blog. All this means that blogs can inspire me in a whole variety of ways. To guide me to interesting books I haven’t read before (old as well as new), to introduce me to delightful people and to help me, in one way or another, with my own writing. One thing is for sure. When I started off on this blogging lark, I had absolutely no idea how much fun it would give me. It’s been a revelation - and it’s become an addiction, but a very pleasurable one. Discussion about great opening lines in crime novels is common enough. But what about great last lines? A number spring to mind, but I don’t want to include spoilers. One of the best, though, crops up in Cyril Hare’s Tragedy at Law – and it must be one of the most original. I thought I'd include it in Patti Abbott's series Friday's Forgotten Books, but I do hope that at least those who have read it haven't forgotten it. Tragedy at Law, first published in 1942, is in fact full of good things. I was drawn to it as a law student by high praise from Michael Gilbert and Henry Cecil, and I was certainly not disappointed. It’s a brilliant and unusual detective story, in which the murder is committed quite late in the book. But interest is maintained throughout, because of the evocative description of the life of an English circuit judge, Sir William Hereward Barber, coupled with acute characterisation and Hare’s good ear for dialogue. The novel features Hare’s police detective Inspector Mallett, but also introduced the unlucky barrister, Francis Pettigrew. Pettigrew proved to be such an effective and appealing amateur sleuth that Hare wisely decided to bring him back for further adventures. Cyril Hare died all too young. He was Faber and Faber’s star detective novelist, and when they were casting around for a successor, they had the good fortune to receive a manuscript from a new writer called P.D. James. The rest is history. But I was delighted to see that, in James’ latest novel, The Private Patient, not only does a plot-line from another novel by Cyril Hare plays a significant part in the story, but she takes care properly to acknowledge her gifted predecessor. I too had a bit of good fortune a few years ago, when out of the blue I was contacted by Cyril Hare’s son, Charles Gordon Clark. To my regret, we never met, but Charles provided me with a great deal of fascinating information about his father. Some of it found its way into an article that I co-wrote with that tireless researcher, Philip Scowcroft, and which, having first appeared in CADS, is now to be found on my website: Cyril Hare. Further to my post about Quantum of Solace, I’ve been reflecting on the Bond movies I’ve seen – at least a dozen, over the years, perhaps more. One reason for this is that, one of these days, I would like to write a thriller of some kind, and though I’ll never be an Ian Fleming (or be able to work with the kind of budget enjoyed by the Bond franchise), it’s interesting to reflect on what makes action thrillers memorable. I’ve read few of the original books, but the movies I’ve seen have mostly been great fun. The story-line ought to matter more than it does. Mostly, the Bond plots are rather iffy, and Quantum’s is no exception. But the touches of wit that you find in the Bond films are important to the overall effect, and so is the balance of the screenplay – I felt that Quantum was better than Casino Royale in terms of structure, even if the latter had a little more depth. And finally, there are the peripherals – such as the gadgets in some of the movies, and the music. I’m a great admirer of John Barry’s work, and – if we leave aside the original spoof version of Casino Royale, which featured the incomparable Dusty Springfield singing ‘The Look of Love’ - my favourite Bond theme is ‘We Have All the Time in the World’, performed by the legendary Louis Armstrong. It came from one of the less renowned films in the series, On Her Majesty’s Secret Service, but that highlights the fact that even the weaker entries over the years have had their magic moments. The two songs, by the way, had different composers, but the same gifted lyricist. I’ve been enjoying Lethal Witness, Andrew Rose’s excellent account of the life of Bernard Spilsbury, whose career as a forensic witness, usually called to give evidence by the Crown, was kick-started by the Crippen case. Spilsbury has interested me for a long time, although he plays only a relatively minor part in Dancing for the Hangman. It’s a good summary of Andrew Rose’s achievement. He documents, for instance, a case previously unknown to me, ‘The Button and Badge Murder’, that of 16 year old Nellie Trew, which Rose regards as one of the great miscarriage of justice cases. A man called David Greenwood was convicted, but there are reasons to believe that athe true culprit was a man by the name of Albert Lytton. Greenwood escaped the death penalty (just) but served fifteen years for a crime he did not commit, and Spilsbury’s evidence probably sealed his fate.. This shocking story is but one of the notable elements in Andrew Rose’s sober, but powerful book. It’s a very readable piece of work, which I can recommend to anyone interested n true crime, or in the portrayal of a man whose great abilities masked a flawed character. Barry Forshaw is a well-known crime fiction critic, and editor of the excellent ‘Crime Time’. His publications include The Rough Guide to Crime Fiction, but he has now produced a much larger and more ambitious two volume encyclopaedia, published by Greenwood. I should declare an interest, in that I contributed several of the essays, and I am one of the many writers whose work is subjected to critical assessment (in my case, by Michael Jecks, a former chairman of the CWA, who is more than generous with his comments.) But, leaving that aside, I am a keen fan crime fiction reference books, and most of those that have appeared over the years weigh down my bookshelves. Barry’s compendium is a very welcome addition. There are so many interesting, and to me unexpected, features of the encyclopaedia that it’s difficult to know where to start in describing them. Barry has described that his emphasis has been on inclusivity, and the authors covered include not only the usual suspects, but also the likes of Peter Ackroyd and Iain Sinclair, who are not conventionally regarded as crime writers. The emphasis is on contemporary writers, but due attention is paid to names from the past such as the excellent Patrick Hamilton (sometimes oddly ignored in books about the genre) and the less stylish but under-rated E.C.R. Lorac. There are a number of longish essays about particular subjects, such as Conventions, Noir, and Police Procedurals. I haven’t read all of them yet, but those I’ve sampled are extremely interesting. Of course, having a large number of contributors means that the approach is not entirely consistent, but that is part of the fun of the book, and besides, the diversity of subject matter and focus offers ample compensation. The price of £90 means that this will not be an impulse buy. But it would make a great present for a crime fan. Otherwise, if you can beg, borrow or steal a copy, or persuade your local library to stock it, you will find much to entertain you. Of course, not all the opinions expressed by the contributors will find universal agreement. Of course, there will be debate about omissions (the choice of crime films which are discussed is highly selective, for instance.) But overall, the only reason why I have wanted to put the books down so far is that, after while, they become rather heavy! ...Edgar Allan Poe was born. To all intents and purposes, he created the detective story, and in his short life he did much else besides. Needless to say, the anniversary of his birth is being widely celebrated, and I enjoyed - among other tributes - Xavier Lechard's on At The Villa Rose, which links to a few of the best features on Poe, including a good, concise essay by Andrew Taylor for the BBC. When in Baltimore for Bouchercon last year, I made my own pilgrimage to the small graveyard where Poe is buried. It's a quiet oasis in the middle of the city streets and buildings. Here are a few of the photos I took. I must say that I find graveyards fascinating, if sometimes melancholy spots, and some have a very special atmosphere. Highgate Cemetery is justly celebrated, and absolutely worth a visit if, like me, you find burial grounds irresistibly intriguing. My Murder Squad colleague John Baker wrote a number of warmly reviewed crime novels in the 90s, but in recent years he has become well-known as a leading blogger. I'm glad to say, though, that he's returned to novel-writing, and his new book, Winged with Death, is due to be published in March. More about this in due course. John's book is published by Flambard Press, as is my latest, Dancing for the Hangman. Flambard have an interesting and eclectic list; they publish poetry, but also, on occasion, such prominent names in the crime fiction world as Val McDermid and H.R.F. Keating, and they are great to work with. I'm glad to say, too, that they have just let me know that Dancing for the Hangman is going into a reprint. Good news, which I find rather encouraging. The death of Sir John Mortimer reminded me of the pleasures I have had from his writing over the years. As a law student, my first encounter with his work was watching a double bill of his plays – one of which was the highly successful ‘Dock Brief’. At around the same time, he created Horace Rumpole, the barrister brilliantly brought to life by Leo McKern in the deservedly popular tv series. I watched pretty much all the Rumpole shows, and enjoyed them enormously. In his professional life, Mortimer conducted many criminal cases, and although his writing covered a wide range of forms and themes, he often dealt with crime. I haven’t read so much of his non-Rumpole work, but I do like, and can warmly recommend as a nice dip-in compendium, The Oxford Book of Villains. This is a compilation which dates back to 1992. It contains an assortment of extracts from literature; Crippen, naturally, makes an appearance in the book, and Mortimer comments in his introduction that the doctor was ‘kindly, modest and hospitable’. Bluntly speaking, this prediction, like so many of its sort, proved to be well wide of the mark. After an initial flurry in the 30s, East produced little notable work in the remainder of his crime writing career and the last time attention was paid to him was on the reissuing in the mid 80s of the splendidly entitled Twenty Five Sanitary Inspectors. This was when Collins produced its very welcome ‘Disappearing Detectives’ set of hardback reprints, with introductions by H.R.F. Keating. The disappearing detective in question was Superintendent Simmonds, who made his debut in Murder Rehearsal, the novel which prompted such lavish praise from the Mancunian critic. This book caught my eye because of its terrific premise. A likeable young crime writer, Colin Knowles, has an admiring secretary, Louie, who notices a series of links between a book Colin has been working on and three apparently unconnected recent deaths. Before starting to read, I wondered if there might be any similarity between this novel and John Franklin Bardin’s later, excellent book The Last of Philip Banter: the answer proved negative. In truth, the best features of East’s novel are that first attention-grabbing idea and the final twist, which offers a rather pleasing and unexpected revelation after I had feared that the story would fade into anti-climax. In between, there is a good deal that is far-fetched. That said, East is a readable writer with a light touch. I was definitely entertained, but overall, this book (while not deserving obscurity) does not compare with the superior work of, say, Anthony Berkeley or Philip Macdonald. The characters are lightly sketched, but Simmonds is an agreeable fellow and it is no surprise that East brought him back for further adventures. The news of Patrick McGoohan’s death saddened me. I was also startled, though of course I should not have been, to learn that he was 80. I still think of him as the smouldering hero of two major television series of my childhood. When it was announced that McGoohan was appearing in a brand new thriller series, therefore, everyone paid attention. I was one of those who watched the first episode of ‘The Prisoner’, in which an unnamed agent (some people suggest it was Drake) is kidnapped after announcing his intention to quit. He finishes up in a mysterious village, where he is known as Number Six. Escape from the village is impossible. The weirdness of ‘The Prisoner’ annoyed many people at the time. ‘Danger Man’ had been straightforward action, but this was a very surreal story-line, very 1960s, as if Kafka had collaborated with a scriptwriter from ‘The Avengers’. I enjoyed it, although like many others I was baffled by it. No wonder it became a cult. Incidentally, if anyone has never visited the real-life location of The Village, Port Meirion in North Wales, I can recommend it most strongly – a wonderful place to visit; it’s also good to stay at one of the hotels, for when the tourists are gone, you can wander around The Village undisturbed – very eerie, sometimes. Later, I enjoyed McGoohan in both Ice Station Zebra (I was going through an Alistair MacLean phase at the time) and in 'Columbo'. I saw little of him after that, but I remain an admirer. His acting range wasn’t in the Alec Guinness class, but he was very good at what he did. He will be missed. The public announcement that Andrew Taylor has been awarded the CWA Cartier Diamond Dagger came after I'd written my post yesterday about the televised version of his extraordinary Roth Trilogy, but it was the happiest of coincidences. The Diamond Dagger is awarded for a crime writing career of 'sustained excellence', and nobody can doubt that Andrew's track record demonstrates just that. I've followed his career since its beginnings, with the fascinating and quirky series about William Dougal, and when I became editor of the CWA's anthology, I was delighted when Andrew came up with the first short story featuring Dougal. 'The Cost of Living' appeared in Perfectly Criminal in 1996, and I said in introducing it that the story 'has all the strengths of the Dougal novels: a neat yet unusual story-line, convincing characterisation and that poignancy which is so characteristic of Taylor's writing'. The same features were evident in his excellent Lydmouth series, and again Andrew honoured me with the first Lydmouth short story, 'The Woman who Loved Elizabeth David', which appeared in Past Crimes in 1998. Several of Andrew's stand-alone novels are quite outstanding. The American Boy won massive sales after it became a Richard and Judy selection, but one of my favourites is the less well-known, but brilliant The Barred Window. And I've mentioned before in this blog that I'm a huge fan of Bleeding Heart Square. I read Andrew Taylor for pleasure, but in reading the books, I also learn more about the craft of crime fiction from a writer who is not only a consummate professional (a bit of trivia is that, years ago, he wrote a number of tv novelisations under a pseudonym), but whose literary gifts are subtle and original. A star of the genre, who will be a very popular Diamond Dagger winner indeed. It’s a truly ambitious story, an account in three parts of the development of a sociopathic killer. Rosie, aka Angel, is played in the first two episodes by Emilia Fox, who has surely never had to convey such a chilling character – yet she does so with real conviction. The first story involves the abduction of a young girl, and it turns out that the motive is revenge upon a police officer called Michael, father of the girl. When he was a boy, he revealed the truth about Angel, and a crime she committed, which is at the heart of the second episode, based on The Judgment of Strangers. Dance, a vicar who happens to be Angel’s father, blames himself, but a friend of his late wife reveals that she is, in a sense, responsible for the terrible sequence of tragedies, for reasons revealed in the third and final episode, The Office of the Dead. Dance is a very good actor, who as David Byfield conveys a mixture of dangerous selfishness and good intentions with real conviction. But I was, if anything, even more impressed by Claire Holman, friend of the family, who plays a vital connecting link between the instalments of the story. Holman was previously known to me mainly from her supporting role as the pathologist in ‘Lewis’, but here I thought she excelled herself. Intensely watchable, very sinister stuff. Strongly recommended. The Girl with the Dragon Tattoo is the first book in the late Stieg Larsson’s trilogy based around the ‘Millennium’ magazine, and featuring journalist Mikael Blomkvist and his mysterious sidekick Lisbeth Salander, has achieved massive sales and a huge amount of critical acclaim. I have been keen to discover what all the fuss is about and now I’ve reached the end of the story. It’s a remarkable achievement for a debut novel, with a fascinating and innovative blend of story-lines. There is what is described as a ‘locked room mystery’ (the name of Dorothy L. Sayers is invoked, and there are various other references to notable crime writers, as well as other classic features, such as the inclusion of a family tree), involving the disappearance about 40 years earlier of young Harriet Vanger. In fact, it might be more correctly described in detective story jargon as a ‘closed circle’ mystery, i.e. where there is a limited, though in this case nonetheless large, number of suspects in the matter of Harriet’s suspected murder - they were confined, in effect, to a small Swedish island. A further question is who has been sending Henrik Vanger (brother of Harriet's grandfather) a pressed flower every year on his birthday. Another puzzle concerns the significance of a mysterious list of jottings that Harriet made not long before she vanished. And there is also the matter of the nasty business mogul who is trying to ruin Mikael, and ‘Millennium’. I enjoyed some aspects of the novel more than others. The mystery of Harriet’s cryptic notes is satisfying; suffice to say that the series crimes to which they refer are horrific and memorable. The revelation of the identity of the principal culprit did not, though, come as much of a surprise. This was because, with so many suspects in the ‘closed circle’, only a few were given any real substance. I also found the financial shenanigans of the sub-plot pretty tedious. The book as a whole, I felt, could have been cut in length without any loss of pace. The translation by Reg Keeland seemed fine, but more extensive editing would have been justified. I did, however, very much like both Mikael and Salander. They are first rate characters and I am really looking forward to reading the next book in the trilogy soon – I have a copy, and a glance at the early pages seems promising. It is a tragedy that Larsson did not live to reap the rewards of his success. The result was that I was horribly disappointed – the youthful Martin Edwards really didn’t fit the profile of the sort of reader who would get something out of a long story, set in an all-women’s college, that doesn’t even include a decent murder mystery. Even after I fell in love with Oxford, and even though I remain a fairly ardent Sayers fan, I never broached Gaudy Night again. I felt it was time to give it another chance, but I decided to wimp out by watching the 1987 tv adaptation by Philip Broadley (a prolific and talented writer of mystery screenplays, who sadly died a few weeks ago.) It was part of the series featuring Edward Petherbridge as Wimsey and Harriet Walter as Harriet Vane – casting choices made in Heaven, I think. I enjoyed the adaptation much more than the book, and appreciated the thinking behind the story in a way I failed to do as a teenager. But I remain to be convinced that Gaudy Night is a masterpiece of detective fiction (a view that a number of good judges hold.) Along with Five Red Herrings and Busman’s Honeymoon, it ranks as the type of Sayers ‘mystery’ that simply doesn’t excite my interest because the good stuff is buried with too much long-winded material that isn’t necessary for the story. It wasn’t the fault of the excellent cast, or of Broadley, who did his best to jazz things up, but still couldn’t avoid the need to pad the story out. My own feeling is that, if anyone tries to adapt Gaudy Night in future, the best plan would be to make fairly radical changes to the action of the plot, while trying to remain faithful to some of the underlying themes – and to make it short and sharp. I’ve never really got to grips with memes and tags, but Ali Karim has asked me (along with various others, including Mike Stotter of Shots Magazine), to highlight 16 little-known facts about myself. I would normally be desperate to come up with some excuse to avoid doing this, but Ali is such a great guy - and I do already owe him a pint or three - that I’m glad to oblige. But then, the awful challenge is to come up with 16 morsels of info that do not immediately characterise me as Britan’s Boringest Blogger. How interesting these bits and pieces are, I’m dubious, but here goes. 1. I was born in Knutsford, the Cheshire town which was the basis for Elizabeth Gaskell’s Cranford, and to this day the law firm I’m a partner in has an office in the town. 2. The first time I wrote about crime fiction, I was seven years old. I recorded in my school book that I’d enjoyed an episode of ’77 Sunset Strip’ called ‘The Chrome Coffin.’ The teacher needed to correct my spelling of ‘chrome’, though. 3. A Team for all Seasons is the title of the book written by my father about the local football club of which he was a passionate supporter and ultimately President. It took him ten years to write and was published shortly before his death. It ran to over 400 pages. Quite an achievement for someone who left school at 14 and had little formal education. He consulted me regularly about his writing, but routinely disregarded my advice – and the book was all the better for it. 4. After I left school, I had what is now known as a ‘gap year’. I spent three months unemployed (it was the era of the miners’ strike, daily power cuts and the three day working week) and then six months working in a factory that made yogurt. Surely this was the least exciting gap year ever. But it certainly made me appreciate university. 5. Balliol, the Oxford college where I studied law, was also the college of those great fictional detectives Lord Peter Wimsey and John Dickson Carr’s Dr Gideon Fell. 6. I saw the Beatles in person when I was about eight years old and many years later carried out legal work for the Cavern Club in Liverpool, where they were discovered. 7. My first book was published in 1983 and rejoiced in the title of Understanding Computer Contracts. Racy, huh? 8. Three years after that, I published a book called Managing Redundancies. Unfortunately, it has again become a very topical subject. In recent years, my book on equal opportunities has reached its fourth edition. 10. My first fiction success was with a short story that won the Southport Writers’ annual competition, judged by the fiction editor of Bella, a women’s magazine which duly published it. It later appeared in Ellery Queen’s Mystery Magazine. After that, there was no stopping me…. 12. I once gave a lecture to a group of international lawyers in the unlikely setting of the Salzburg castle where much of ‘The Sound of Music’ was filmed. 13. My favourite sport is cricket, but currently my clients at work include Liverpool Football Club and the Football Association. 14. Although I tend to take the Edith Piaf line on regrets, I do regret never learning to play the piano. But when I was a student, a song I’d co-written was recorded on an album by an Italian musician and I was featured in the pop column of ‘The Oxford Mail’. (Someone currently selling the album on eBay describes it as ‘unusual’….) One of my neighbours now is Ian Brown, a rock musician formerly of the Stone Roses, but I have not been brave enough to tell Ian about my past life as a songwriter. 15. The first pop music concert I attended was by Dionne Warwick, in 1976, and the most recent was by…Dionne Warwick, last year. 16. A phrase that crops up several times in my novels is: ‘Life is short’. Something I strongly believe. 'This 1982 novel, based on a television series which came out seven years earlier, shows Durbridge at his best. The protagonist is not Durbridge's regular sleuth Paul Temple, but wealthy publisher Peter Matty who, when in the company of his brother Claude, a famous pianist, meets an attractive woman at Geneva airport. Soon he bumps into her again and learns that her name is Phyllis du Salle. An air of mystery clings to her that fascinates Peter – and when she vanishes unexpectedly, he becomes obsessed with tracking her down and discovering the truth behind her apparently secretive life. A macabre toy – the doll of the title – is found floating in the bath, an image that lingers in the memory. The constant twists of the narrative, coupled with its unrelenting pace, make this a very suspenseful book. Although Durbridge was not as good a writer as Cornell Woolrich, and in particular lacked the American master’s ability to create emotional resonance in his situations, he was at least equal to Woolrich in devising storylines that tantalise and intrigue. Are book launches a good idea? An obituary notice I was sorry to read today reminded me of a lunch in London fifteen years or so back, and a discussion about whether book launches are worthwhile. The obituary was of Tony Mott, a publisher once of Penguin Books; he later moved to Transworld, where he was involved with publishing Bantam paperbacks prior to his retirement more than a decade ago. My first four books were published in paperback in the UK by Bantam (the deals were done by the hardback publisher Piatkus, which didn’t have a paperback imprint at the time.) I had a female editor and she invited me down to London for lunch one day. At the last minute, however, she couldn’t make it, and I was greeted at the restaurant by an affable chap who introduced himself as Tony Mott. I’d never heard of Tony, but I think that in fact he was my editor’s boss, so I was quite honoured. This had never even occurred to me, not least because at that time neither Piatkus nor Bantam had ever proposed a launch. Since moving to pastures new, though, I’ve had a number of launches. I mentioned one or two in my post about London bookshops yesterday, and 2008 was a bumper year, with no fewer than three launches, for Waterloo Sunset, Dancing for the Hangman, and the CWA anthology, M.O.. I think Tony was right that launches don’t make a major impact on sales, unless you are already a best-seller, and I suspect he’d grown weary of authors who have unrealistic expectations of them. But I’ve enjoyed both my own launches and those of a number of writer friends. Launching a book is a good excuse for a party. They might not be commercially beneficial, to any measurable extent, but they certainly can be great fun. 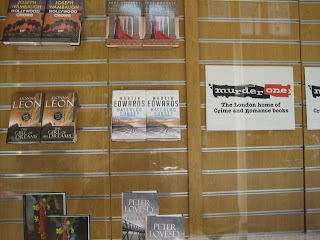 I was very sorry to read that Murder One, the legendary crime bookshop in Charing Cross Road, has fallen victim to the credit crunch, and is to close at the end of this month. I well remember my delight when the shop first opened, in Denmark Street. Over the years, naturally, I bought quite a number of books there. After a while, at the 1990 Bouchercon, I got to know the owner, Maxim Jakubowski, who is a man of many parts. Not least, he is a prolific and notable crime anthologist; I am in his debt, for if he hadn't included 'The Bookbinder's Apprentice' in his Best British Mysteries, it would never have won the CWA Short Story Award. I'm sure he will continue to feature prominently in the crime fiction world. Small businesses up and down the country are suffering through no fault of their own. Bookshop businesses are, by their nature, highly vulnerable to economic stresses and strains, and their disappearance from the scene is bad news for customers, and especially for the people who work in them. I’d hoped that Murder One would continue to survive, and I’m sad that it hasn’t. But it’s worth paying tribute to Maxim for his vision in setting it up,and for keeping it going for almost 21 years. Quite an achievement, quite a bookshop. ‘I sometimes use real people's names in the Shetland books - a bit of fun and occasionally a way of thanking friends and people who've helped. In Raven Black, I mention the Harvey girls; one of the lead characters goes to their party. Appropriate I thought, because whenever we visited Liz and Paul and their daughters were home the house was full of people and laughter. Last year the youngest Harvey girl, Vaila, was diagnosed with cancer. It seemed that the illness had been treated and when I visited Shetland for Up Helly Aa, she was there watching the parade, cheerful and energetic. But on my next trip in May she was desperately ill in hospital in Aberdeen. It seemed that the whole of Shetland was holding its breath, willing her to get well. Unfortunately she died soon after. She was sixteen years old. Her parents have decided to set up a fund in her memory, to allow Shetland young people to have the adventures Vaila would have enjoyed. Travel from Shetland can be complicated and expensive. Vaila's Fund would make it possible for a student of Vaila’s age to explore the world away from the islands. The fund will be administered by teachers from the Shetland High Schools and will be the best possible memorial for the young woman we, who knew her, already remember so fondly. To support the fund, I'm offering you the chance to have your name (or that of your friend or relative) in the fourth book in the Shetland quartet. Of course you'd get a signed first edition and an invitation to the launch party! The book will be published in the US and probably be translated into a dozen languages. Take part in the online auction and become a character in this popular series. I watched the new James Bond film several days ago, but I only just got my breath back. Talk about action-packed, it’s a thriller with non-stop car chases, boat chases, plane chases, killings, beatings and attempts to hold heads of state to ransom. Most people say that Casino Royale is a better movie than its successor, but I felt Quantum of Solace held its own, despite the dodgy title and even dodgier soundtrack and theme song (bizarrely, the classic 007 theme is held back until the end.) The success of the film is thanks in the main to Daniel Craig’s mesmeric performance as an agent bent on revenge and almost out of control, but Judi Dench is at her best as M, who has a larger role in events than usual. To be honest, though, it’s best to forget the political edge to Amalric’s performance and the screenplay. Quantum of Solace is very good escapism. And we can all do with a dose of that, every now and then. The ITV 1 drama Caught in a Trap was a crime story, although not a mystery, and I enjoyed it a lot. It starred Connie Fisher, previously known to me only as a singer who won a talent contest on the BBC, playing the part of Gemma Perkins, a council worker who falsifies the takings from local parking meters to fund her craving for memorabilia connected with Elvis Presley. The impressive script, by James Graham (a young writer who is definitely a name to watch, if this is anything to go by) was inspired by a true crime. A distinction is drawn between a script ‘inspired by’ real events and those ‘based on’ those events. It seems that Graham was much taken with the essence of a story, rather than the details, and his approach seems very sensible to me. The real life case was that of Julie Wall, a North Kesteven council employee in her 40s, reportedly a ‘mild and modest’ individual who stole over half a million pounds, mainly on Elvis-related stuff before getting her inevitable come-uppance. The fictional Gemma was an attractive 28 year old. Connie Fisher played her very well, in an under-stated yet compelling way, and was admirably supported by a strong cast, including two actors of exceptional gifts, Jim Carter and Geraldine James. Needless to say, the drama featured a lot of Elvis songs – including two which provided titles for books in my Harry Devlin series. One was The Devil in Disguise, and the other my favourite Elvis song, Suspicious Minds – from which the highly appropriate ‘caught in a trap’ title comes. The reaction to Dancing for the Hangman since its UK publication a few weeks ago has really thrilled me. It’s a novel I loved writing, but it’s so different from my other work that I was unsure how readers would respond to it. The enthusiastic comments made by those who have read the book have therefore been a great boost to morale. I was especially thrilled to see that January Magazine – a major online resource – included it in the list of the best books of 2008. A real thrill, given that other names in the line-up included greats such as James Lee Burke and Michael Connelly. No question about the highlight, for me, of the holiday season television schedules. It was last night’s episode of Jonathan Creek, a two-hour humdinger called The Grinning Man. It’s the first new Creek show for five years, but David Renwick, the brilliant writer who created Creek, has lost none of his flair for combining sharp wit with baffling murder mysteries. I’ve watched every Creek case, and I felt this was the best ever. Alan Davies, of course, reprised the title role, but there was no sign of either Caroline Quentin or Julia Sawalha, his previous co-stars. No matter – he was soon involved in a complex puzzle involving the Nightmare Room in a spooky old mansion. Back in 1938, when the house was owned by one Jacques Futrelle, a Harvard professor spent the night in the Nightmare Room, which was duly padlocked and rendered totally inaccessible – but he disappeared, never to be seen again. It’s a classic set-up, which John Dickson Carr would have loved. Renwick also nods to one of the early masters of the locked room mystery by using the name of Jacques Futrelle – as fans of classic mysteries will know, the real Futrelle wrote a number of celebrated impossible crime stories featuring a cerebral sleuth known as ‘the Thinking Machine’. The eponymous Grinning Man is a painting by Bosch, which hangs in the Nightmare Room. But even when the mystery of the fate of the professor (and of others foolhardy enough to overnight there) is solved, there is another apparently impossible puzzle to be unravelled. For a 21st century television writer to display such mastery of the craft of the classic detective puzzle is in itself deeply impressive. But Renwick’s skill extends far beyond the technical – he knows how to entertain a modern audience and to keep viewers hooked from start to finish. This cunningly contrived story deserves to be recognised as a modern classic. New Year, new resolutions? It’s exactly one year ago today since I started Chapter One of the fourth Lake District Mystery, provisionally entitled The Serpent Pool. It seemed like a nice idea to begin the new year with a new book, though with hindsight I think I began before the story was really clear in my mind, so that quite a lot of re-writing has been required. A lesson for me for the future. All told, I’m afraid the book made rather slow progress during 2008, with the result that there’s still quite a lot to do on it – so I suppose my first writing resolution ought to be to get it finished and in the best shape possible! Achieving that may well take up a large chunk of my personal quota of resolve. But of course I do have other aims and ambitions for the year ahead. One that I will share is that I plan to include in this blog a few more comments about the actual writing process that I hope are of interest, both to intending writers and others interested in the craft. I meant to do this in 2008, but at times I got carried away with recording thoughts on the events of an unusually hectic year. Different visitors indicate that they like different types of post, so apart from more about writing itself, I’ll probably continue in 2009 with the mixture roughly as before. One resolution I ought to make is not to buy any more books. The reason is simple. I have huge piles of them here, waiting to be read – enough to keep me going for years Many of them are books I’m really keen to devour, including a number written by very good friends, but lack of time is the problem. However, I suspect there is just no way I’ll be able to resist the urge to add more titles to the collection. And from time to time I’ll flag up interesting-looking books here, in the hope that you will give me a few clues as to whether they should zoom to the top of that to-be-read heap. ‘We're offering free sample issues of Mystery Scene at our website. Would you please help spread the word? All anybody has to do is go to www.mysteryscenemag.com and request one, no obligation.